In a tale of two Washingtons, the sustainable aviation fuels movement will gather in Washington state in March and in Washington, D.C. in April to seek breakthroughs in the adoption rate of jet biofuels, which have been stalled for some time between the successful certification/demonstration efforts of the last decade and the widespread deployment which is the focus of all the effort. That’s a basically rational market, for the long-term, and allows for expansion of energy consumption over time, as population grows and economies become more sophisticated. Bids for carbon capture storage might simply follow what in markets are called Dutch auctions (learn more about those, here). And a nice business opportunity for energy companies, long-term, would be gained for energy companies and others — competing both in the low-carbon fuels and carbon storage businesses. All it would require is the appointment of an authority to clean up the carbon trash — as, years ago, authorities were appointed to clean up bodies of water, or clean up alleys that stank from garbage and waste. It’s worth pausing for a moment here, since one of these aforementioned events is being hosted by the Port of Seattle, to remember a Seattle-based civic pioneer named Jim Ellis, who pushed a series of municipal bond issues a generation ago to clean up Seattle’s Lake Washington (among many other objects aimed at greening Seattle). You might be surprised to learn that this successful civic effort aimed at environmental transformation was generally led by Republicans. A group of young GOP leaders named a series of transformative bond issues “Forward Thrust” (using imagery from the development of supersonic transport by Boeing in the 1960s that also led to the nicknaming of Seattle’s NBA team the Supersonics). The same GOP leadership group also pushed through the establishment of Washington state’s Department of Ecology, which became one of the models for some of better aspects of the federal Environmental Protection Agency. All of which to say, from Iowa to Washington state, you more than occasionally run into the bipartisan spirit, albeit at a state level, when you visit the western United States and look into the nexus between environmental and development policy. 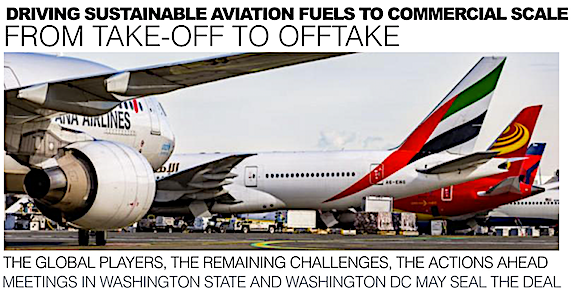 The Washington Sustainable Aviation Fuels Summit will be held 07-08, March 2019 and accepting registrations. Here is the link: https://www.washingtonsaf.org. About the event: At the two-day Washington Sustainable Aviation Fuels Summit, you will hear from national leaders on engaging and aligning the entire sustainable fuels value chain as we bring Washington’s most innovative industries together to develop a local supply chain of clean and sustainable fuels for aviation. Port leadership and staff, local government, state government, fuel producers, feedstock providers, financiers, national and international thought leaders, academia, NGOs, airlines, aircraft manufacturers, and large corporates in the Region. 3. inform the discussion around sustainable aviation fuels as WA legislators are contemplating a low carbon fuel standard. The DC event – the Sustainable Aviation Fuels Summit at ABLC 2019. About the event: At the 3-day Washington Sustainable Aviation Fuels Summit, you will hear from national leaders on engaging and aligning the entire sustainable fuels value chain as we bring Washington’s most innovative industries together to develop a local supply chain of clean and sustainable fuels for aviation. Location: The Mayflower Marriott in downtown DC. Audience: The global sustainable Aviation Fuel suppliers, scientists, consortia, airports, project developers, airlines, aircraft manufacturers, policymakers, financiers and NGOs.. It’s a key part of the Advanced Bioeconomy Leadership Conference, which takes place throughout the week (on stage April 3-5, and with sideline events earlier in the week). 1. engage and align the entire sustainable fuels value chain toward sustainable aviation fuel solutions, worldwide. Highlight emerging technologies, financing structures, infrastructure developments, offtake opportunities, networking of project developers and suppliers, presentation of market forecasts, review of policy status and proposals including new proposals for low carbon fuel standards. In Indonesia, Reuters reports that the country is playing hardball with the US and France, demanding that its companies be able to set up aviation biofuel production plants using palm oil as feedstock in those countries in exchange for buying Boeing and Airbus planes, respectively. The country’s trade minister said he received positive feedback from the US’s secretary of commerce during meetings in late July and has also communicated the requirement to Airbus. Local media reports that the country said it would stop buying from Airbus if the EU banned palm oil use in biofuels. In Canada, the Minister of Natural Resources issued a nationwide challenge to Canadians to develop the cleanest, most affordable and sustainable aviation fuel for the aviation sector to further reduce its carbon footprint and fight climate change. The Sky’s the Limit Challenge stimulates the development of sustainable aviation fuel supply chains so that the Canadian aviation industry can further reduce its greenhouse gas emissions and lower the flying public’s environmental footprint. While the Canadian aviation sector has made significant investments in a fuel-efficient fleet, other measures such as sustainable aviation fuel will be required to achieve industry targets of carbon-neutral growth by 2020 and a 50 percent reduction in CO2 emissions by 2050. New Energy Risk’s new performance insurance for TCG Global’s gasifiers and a significant project advance from Velocys in the UK are on the docket. These companies have key project components in common: the Red Rock Biofuels project which breaks ground in Lakeview, Oregon next month, aiming to supply 15 million gallons per year of renewable jet fuel to FedEx, Southwest Airlines and potentially the US Navy, made from waste woody biomass. TCG supplies the gasifier system and Velocys microchannel FT technology is converting that syngas to fuels.